We are all more or less familiar with the Mahabharata and the war between the cousins of Chandravansh or the Lunar Dynasty, for the righteous heir to the throne of Hastinapur. This article goes back to the first man, whom the dynasty was named after, Chandra or the Moon. In those days, it was a tradition to name famous dynasties after the astronomical objects. We know that Lord Ram was a descendant of the solar dynasty i.e. a Suryavanshi. Likewise, the descendants of Chandra were known as the Chandravanshi. In Semitic faiths, there is a concept of the progenitor as the human pair Adam and Eve. In Indic faith, there are at least ten progenitors or the Prajapati, of mankind; all of them were born from the mind of the Brahma, creator-deity of the Trinity. One of the Prajapatis was Maharsi Atri. You may be familiar with the name, Atri, as one star of the Saptarsimandal or the Big Dipper constellation is named after the great Vedic sage. Another Manas-putra (born from the mind) of Lord Brahma was Rsi Kardam. He did severe penance at the banks of the now-dried river Saraswati. The protector-God of the Trinity, Lord Vishnu appeared before him & blessed him with nine daughters & a son. Lord Vishnu said that he, himself, would be born as his son & all of her daughters would give birth to great sages. Meanwhile, King Swayambhu Manu & his wife, Queen Shatarupa, were looking for eligible bachelor for their daughter Devahuti. He met Rsi Kardam at his hermitage and was impressed by his learning and wisdom. The King requested the sage to accept his daughter as his wife. Kardam agreed but with a condition. Once the ten children were born from Devahuti, he would leave the house & would lead an ascetic life. The King agreed to this demand and happily married off his daughter to Sage Kardam. One of the nine daughters was named Anusuya. The youngest child was Sage Kapila, incarnation of Lord Vishnu himself, propounded the Sankhya philosophy. Maharsi Atri was married to Anusuya. According to the Purans, together, they performed severe Tapasya to please the Trinity. The Trinity blessed them that they would be born to the couple as their children. In time, Anusuya gave birth to Chandra, Dattatreya & Durbasa. When Chandra became an adult young man, the Vedic sages inducted him as the Lord of drink, Som, an extract from the herbal plants. One Prajapati Daksh, gave her 27 daughters, namely Rohini, Aswini, Bharani etc star-deities, to Chandra as brides. Among the wives, Rohini was the most beautiful and Som-Chandra, enchanted by her elegance, would spend most of his time with her, leaving the other 26 wives frustrated and angry. The wives returned to their father’s palace and requested Daksh to convince Chandra, so that he would make love to each of them equally. But Daksh’s repeated attempt to make his son-in-law to behave accordingly, failed. Daksh, in fit of rage, cursed Chandra to suffer from Yakshma or Tuberculosis disease. Suffering from this dreadful disease, Som-Chandra performed a tapasya to the Destroyer-God of the Trinity, Lord Shiv. As per the Lord’s advice, Chandra took a dip in river Saraswati, at the bank known as Prabhas Tirtha. This place is currently the Shiv temple, Somnath (Lord or Savior of Som-Chandra) in Gujarat. This partially lifts his curse for a fortnight, allegorically resulting in the waxing & waning of the Moon. 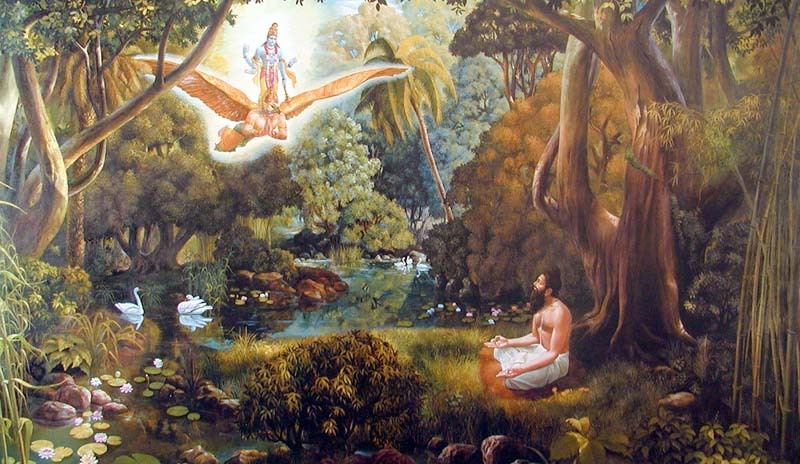 In another Purana, Chandra performed a tapasya to please Lord Vishnu. He sought that, in his Rajsuya Yajnya, all the Devas & the Trinity would take part. Rajsuya Yajnya is a Vedic ritual, translated in English as Imperial sacrifice, which enables a King to declare himself as an emperor. Lord Brahma himself sang the Vedic hymns from Sam Veda in that yajnya. Many devas, including Lord Shiv, happily participated in Chandra’s yajnya to make it a grand success. Completion of this ritual made Chandra more prosperous, wealthy & proud of himself.